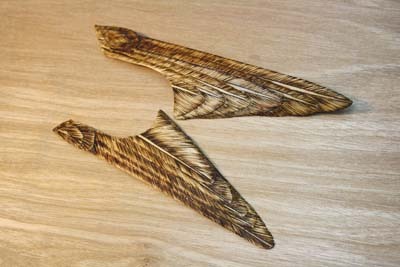 I never burn in a straight line otherwise this would give the feather a Christmas tree look which is best avoided! The first thing to do is to apply four thin coats of gesso to the bird, ready for painting. This will give the white undercoat for which to build on. 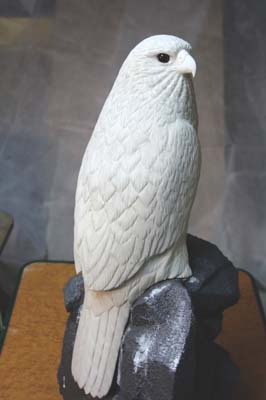 The gyrfalcon has fascinated me for a very long time now, with its beautiful white plumage and large size, and as I love carving big birds of prey, this one seemed the obvious choice to do. I have carved about five of these and they never seem to stay with me for very long - someone somewhere always wants to buy them from me, so I guess they are a popular choice! 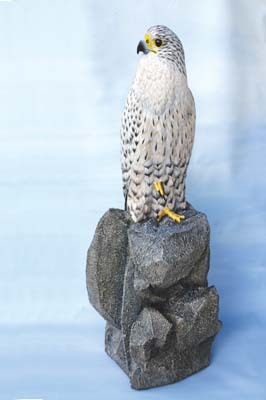 This particular gyrfalcon came about for a friend who had done me a few good turns in the past, and I wanted to do something special for him in return, so opted for this spectacular and distinctive bird. I am pleased to say that he is very happy with it! 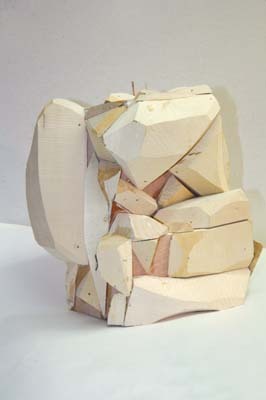 It looks like I might have to carve myself another one and see how long I can keep hold of it! bird using a 4 1/2in grinder with the rather good Holey Galahad disc. I then used my 4 1/2in grinder with an 80 grit sanding disc to sand back further, in preparation for drawing on the feather groups. 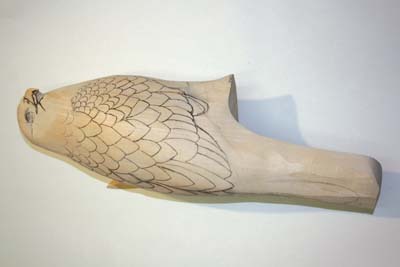 With the gyrfalcon sanded and shaped, draw in the feather groups. Next we need to cut in the feather groups. 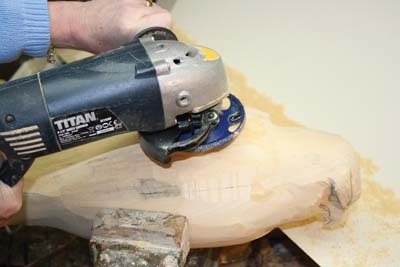 Here I am using a green Saburr Tooth taper on a rotary powered carving unit, taking extra care with the speed. You can, of course, use a selection of gouges. 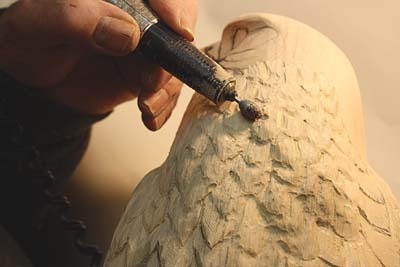 Using a carving knife, start shaping the face of the bird. 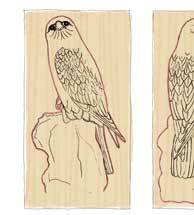 Draw the beak back onto the gyrfalcon - I find here that it is useful to make a cardboard template of the bill and draw around this to get things spot on. 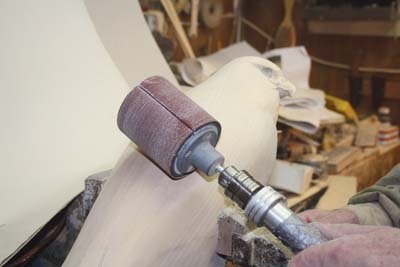 Using a large sanding drum in a flexi drive, sand the upper and lower back smooth, ready to draw in the back feathers. Now it's time to draw all the wing feathers on one side of the bird. 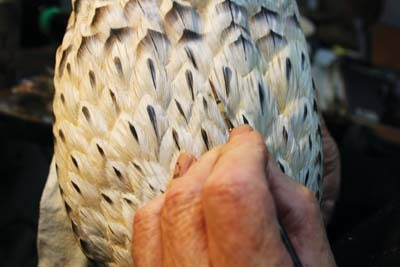 Then using tracing paper, trace the feather patterns and transfer it to the other side of the bird. Now all the feathers are drawn in. 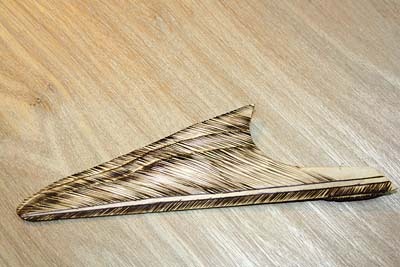 a Kutzall taper. 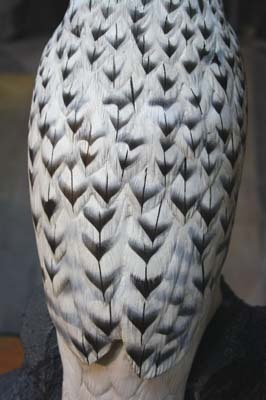 Then with a small rubber sanding drum loaded with 400 grit paper, sand all the feathers until smoothed out - of course you could hand sand this. 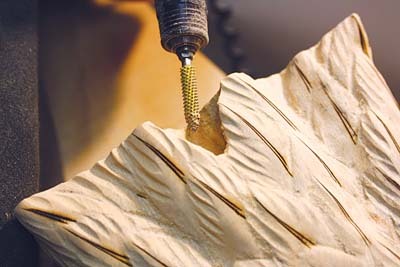 Using a small ball-nosed diamond bit in the high-speed grinder, start to 'soften' all the edges of the feathers. 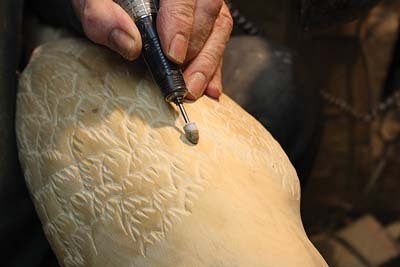 Then go over all the edges using a ball-nosed CeramCut blue stone in a high-speed grinder, and make some 'splits' in the feathers using a small smooth diamond point. 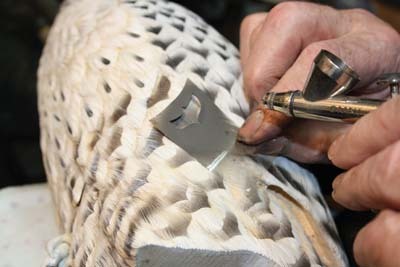 I use the Burnmaster pyrography unit with a Razertip 14M medium knife tip to burn the shafts of the feathers on the back, then using a high-speed grinder with a small white stone, go in and 'relieve' some of the shafts. 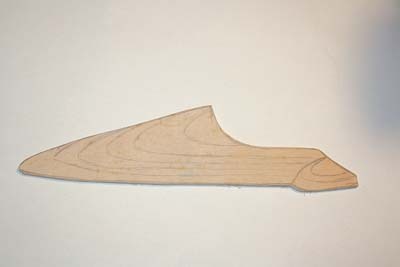 Draw in all the breast and flank feathers - you can see here that I have carved down into the middle of the breast area in preparation for cutting in the groove for the falcon's raised foot. 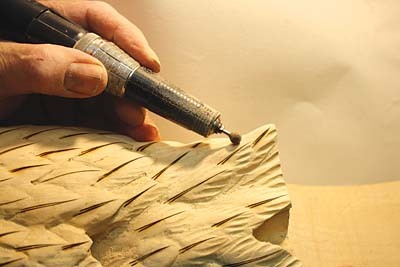 Now carve the breast and flank feathers with a small Kutzall taper. 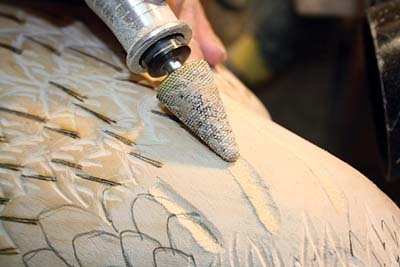 Using a smooth diamond burr in a high-speed grinder, start to smooth and put shape in the feathers, then sand over all the feathers to smooth them out. 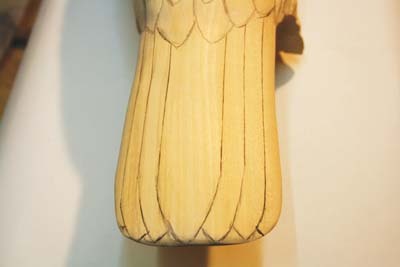 As with the back feathers, burn in the shafts on the front of the bird. 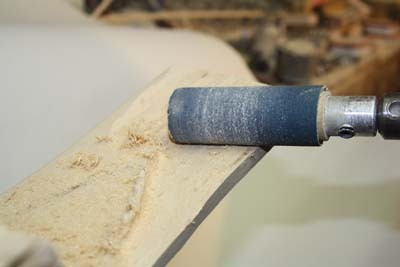 Then using a ball-shaped diamond in the high-speed grinder, start to 'soften' the edges of all the feathers and go over it all with a ball-nosed CeramCut blue stone to smooth it all out. 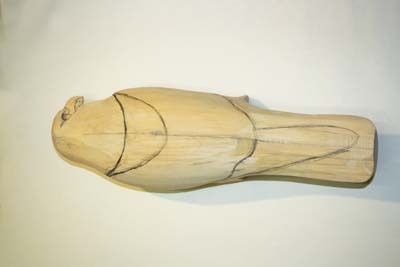 Use a Saburr Tooth point or similar in your rotary power carver to cut in the groove for the gyrfalcon's raised foot and the bottom foot. 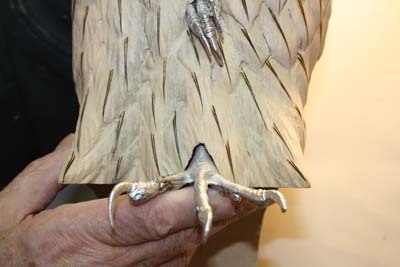 I use ready-made pewter feet, which you can buy in from taxidermy suppliers. 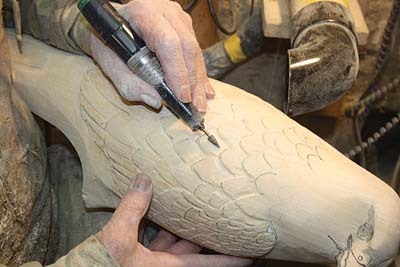 Use 400 grit abrasive to clean up all the edges of the feathers by hand before moving on to carving the tail. 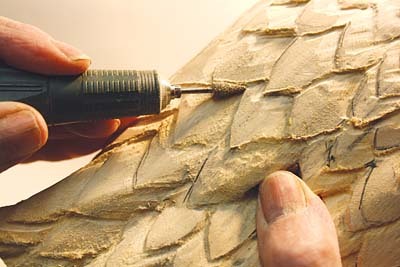 Using a Saburr Tooth taper or similar, carve in under the tail coverts and then sand both under and on top of the tail with a drum sander. 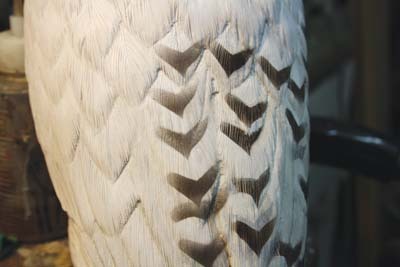 Draw in the tail feathers, front and back, and use a carving knife to cut them in. 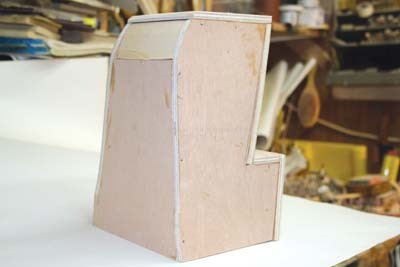 When done, sand the top and underneath with a drum sander. 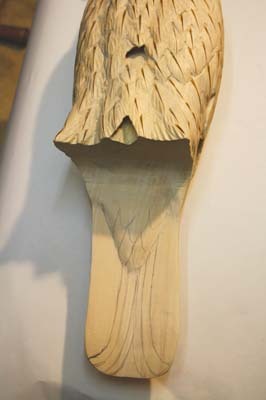 Use a small Kutzall bit to carve grooves in the face and throat to give the bird some character. 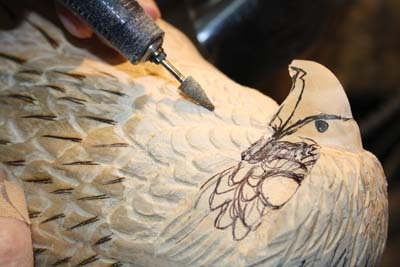 Draw small feathers on the back of the head and carve in using a coarse diamond point in your rotary carver. 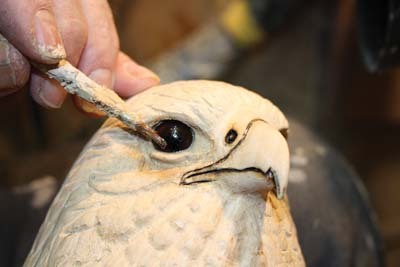 Cut the holes ready for the eyes using a small tungsten cutter, then position the eyes using plastic wood. 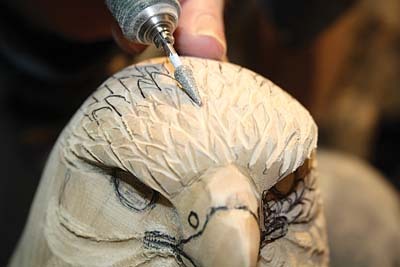 Leave to dry before adding the eyelids, again using plastic wood - apply with a paintbrush. 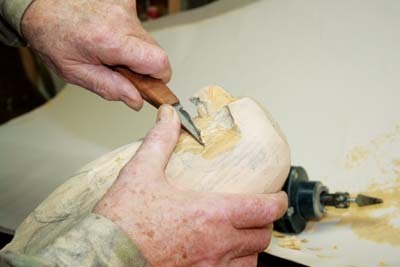 Use abrasives to finish sanding the bill and once done, soak in super glue to add strength and make it more bone-like. 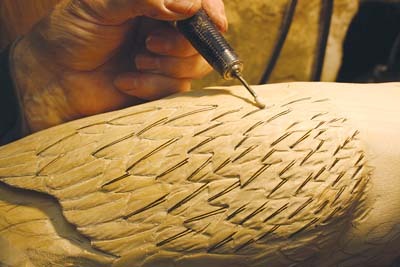 sand the individual feathers with 400 grit abrasive. 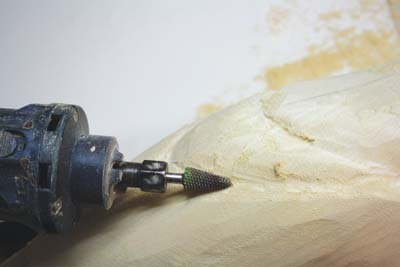 Wait until you have pyrographed and painted everything before inserting the primaries but for now, make two deep incisions into the bird where they should be, using a 1/8in carving drill. Make sure you make one cut higher than the other, as the primaries need to cross one another. 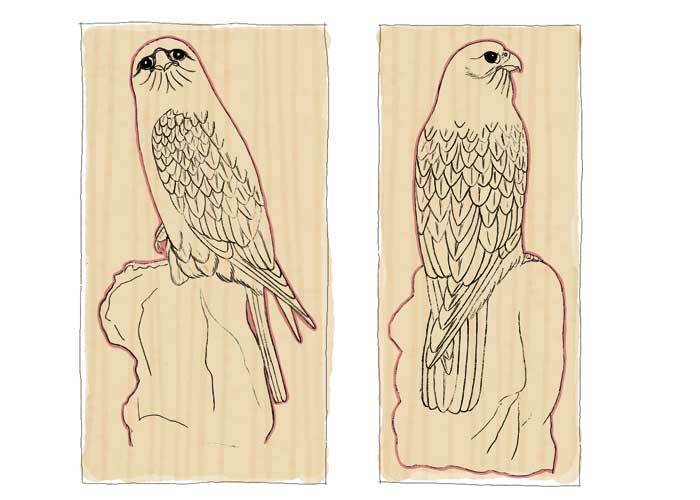 Use a pyrograph unit to burn in the feathers on both the gyrfalcon and the primaries. I used a Detail Master 1c general-purpose point to get the feather effect. 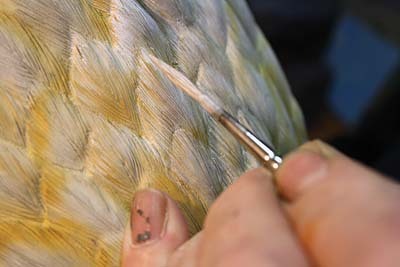 Starting on the outer edge, draw the pen to the centre, burning the edge of the feather away - when you come to paint the feathers, this shows the individual feathers better. I never burn in a straight line otherwise this would give the feather a Christmas tree look which is best avoided! 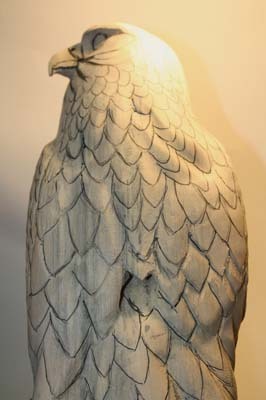 With the gyrfalcon carved and pyrographed, it is now ready for adding the distinctive white plumage. You can, of course, leave the bird as it is if colour isn't your thing, but the acrylics really do bring this gyrfalcon to life. 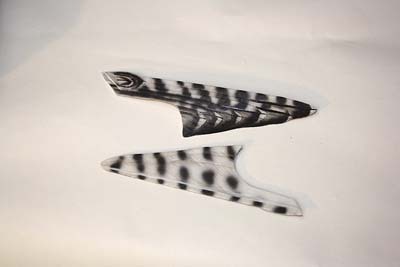 Make thin card templates with feather patterns on and airbrush onto the back using burnt umber and black acrylics from the Jo Sonja range. If you have other acrylics, then go ahead and use those but make sure you get the colours right! Turning to the front of the bird, lightly airbrush 'shadows' onto the flanks like so. Now using yellow ochre acrylic, airbrush all the edges of the breast and flanks. 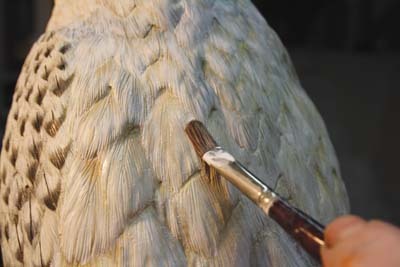 Starting on the outer edge of each feather, drag white gesso over the flank feathers using a fine sable rigger paintbrush. The yellow ochre makes the bird look warm when finished. Do the same procedure for the breast feathers. 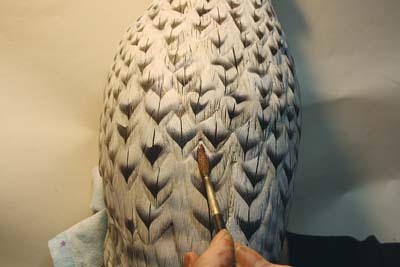 With a watery wash of raw umber, go over the flanks and breast feathers, which will bring back all the burning detail. Next add feather detail on the flanks using templates and drag some white acrylic over the feathers as before, to soften the detail a little. 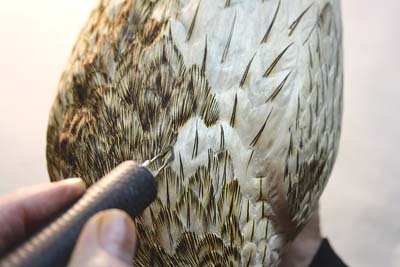 Using a teardrop template, spray onto each breast feather and then paint in all the shafts using a fine liner brush. Mix raw umber and white to make a light grey, and using the fine liner brush, randomly paint in 'splits' in the individual feathers. Again using templates, spray in the fine markings of the cheeks, and use a fine paintbrush to add in some fine lines. The forehead and the back of the head are done in the same way. Paint in all the shafts on the back of the bird and go over with a watery wash of raw umber to bring out the burning detail. 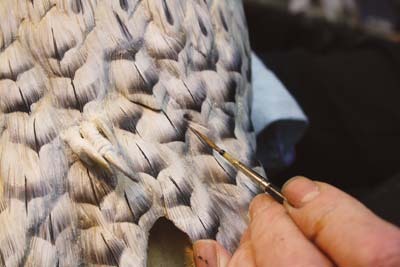 The primaries are painted following the same steps as above, and are ready to be inserted. 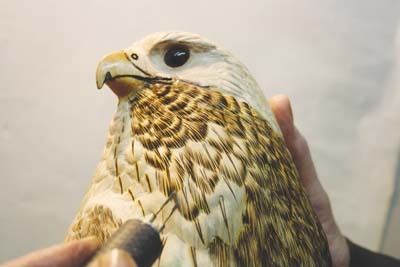 Secure them with wood glue and the gyrfalcon is completed. The pewter feet are covered with an undercoat of grey metal primer, with white gesso on top. I then mix up some acrylics to get the right shade of yellowy-orange bird feet, and finally coat with a very thin wash of raw umber mixed with clear satin varnish to bring out the colour and shine. 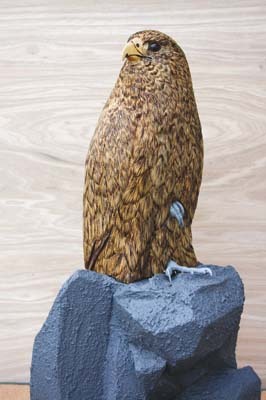 For making the large rock on which to seat the gyrfalcon, I used plywood and constructed it into a box, and then glued small offcuts of wood to form the shape of the rock, before applying gesso all over. And don't forget to fix a metal rod on the top to attach the bird once the rock is completed. 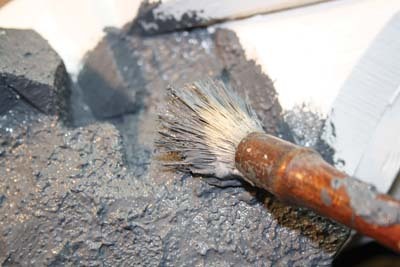 Next, cover the rock in acrylic texture paste - I make my own using ceiling-ripple mixed coarse sand and black gesso to give it the granite colour. Next, airbrush on some dark colours to give depth. When dry, use white gesso to dry-brush highlights all over the rock and further highlight random parts. 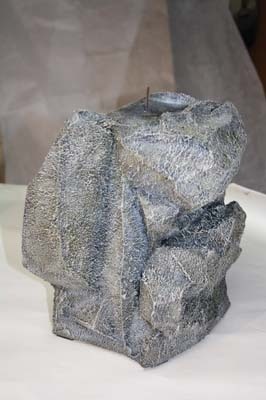 With a very watery wash of a mixture of raw umber, a touch of black, and a small amount of matt varnish, apply all over the rock to give it its finished appearance. 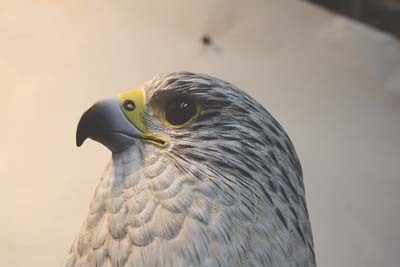 Now secure the bird onto the metal rod at the top of the rock and glue with two-part epoxy, and with this final step, you've got yourself a beautiful gyrfalcon. 1. 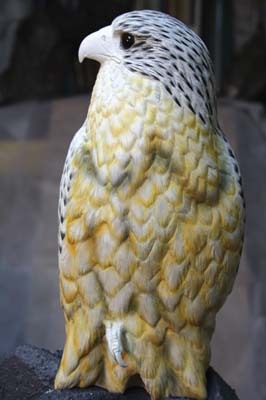 The gyrfalcon (Falco rusticolus) is the largest member of the falcon family, with males ranging in size from 480-610mm (19-24in), with a wingspan of 1100-1300mm (43-51in); and females 510-650mm (20-26in), with a wingspan of 1240-1600mm (49-64in). 2. Plumage varies from dark brown to all white, and they can be identified by their long, broad, pointed wings, and long barred tail. 3. Breeding takes place in arctic and subarctic areas such as Greenland, Iceland, Norway and Canada. They are not nest-builders, preferring to use the nests of other species, usually located along cliff ledges. 4. A typical diet includes partridge, geese and coastal birds, plus mammals ranging in size from voles to hares. 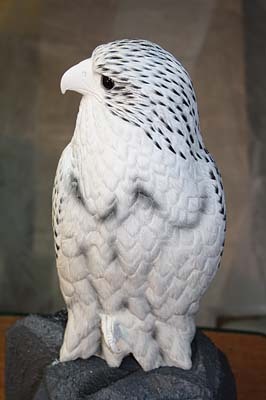 The gyrfalcon strikes prey or drives it to the ground, very rarely snatching it in the air.